Augusta-Richmond County is a merged city-county located in east Georgia bordering South Carolina along the Savannah River. Despite being the third largest city in Georgia, Augusta is world-renowned due to being the host city for the famed golf tournament, The Masters. Augusta experiences all four seasons with mild winters and hot summer months. From winters in the 30’s, to hot and humid summers in the 90’s, Augusta’s outdoor green spaces and parks are ripe with an array of plants and animals. 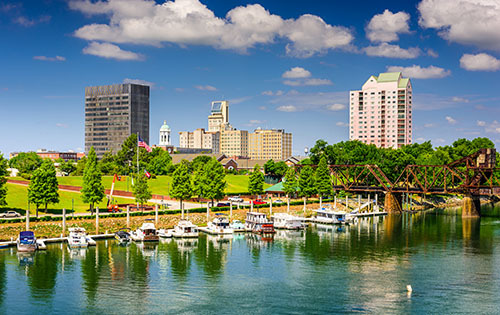 In addition to the immaculate grounds of the August National Golf Club, its Downtown historical district, Riverwalk and canal tours attract tourists and visitors from abroad. Augusta-Richmond County enforces regulations to protect their city, its wildlife, and resources. The ordinances dictate everything from tree removal regulations, the variance application process, and public and private development permits. Following is an excerpt from www.treeremovalpermit.com/georgia/augusta-richmond-county-ordinance-arborist-permit-application/ of the Augusta, GA, tree ordinance and permit process. Tree Emergency – If storm-damaged limbs or a fallen tree is encountered in the roadway or public property, the situation should be reported via 3-1-1, and its removal will be handled immediately. Interfering Tree – Residents should report trees that pose a hazard to utilities and power lines to the City, which will dispatch an arborist to determine if the tree needs to be trimmed back or removed completely. Public Tree Fallen on Private Property – In the event a tree from public property falls onto private property, again the City should be contacted for its removal. Each of these situations can be immediately addressed and resolved via the City of Augusta 311 Service (dial 3-1-1 from within Augusta or (706) 821-2300 otherwise). If the tree being considered for removal is on private property (under 1 acre), you are usually exempt from and do not require a removal permit (*Unless the tree in question is a Landmark tree). Up to 5 trees may be removed within a calendar year. Protected Landmark Trees – Within Augusta, Landmark Trees (trees with historical significance, high value or unique character) are considered public landmarks. These species are protected in the Ordinance, and cannot be destroyed or endangered unless otherwise recommended by the Augusta Tree Commission. The Augusta Planning and Development Department can provide further clarification on the tree ordinance, permit, and land development plan requirements. Use the below information to contact the respective city department representative.